Below, we are describing the main features offered by the Magento 2 custom success page module by Aheadworks, and give an overview of its backend functionality and frontend appearance. Besides showing important order related information on the success page, store owners can set specific conditions based on the customer and order data to trigger rule-based content display. This way, you can leverage flexible rules to automatically trigger different information blocks depending on a customer group, store view, payment or shipping methods, and other conditions. The next significant improvement provided by the Aheadworks better thank you page extension is a simplified registration process. The module allows customers to go through a quick registration process right on the order confirmation page. 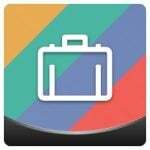 This option helps merchants to turn their one-time buyers into registered users in the simplest way. Besides, you can place a newsletter subscription form on the thank you page, offering your website visitors to get the latest news and updates from your store. Recent researches prove that about 30% of online shoppers proceed to checkout skipping the cart page. Thus, to reach out to customers, it makes sense to show your promotions at the checkout. 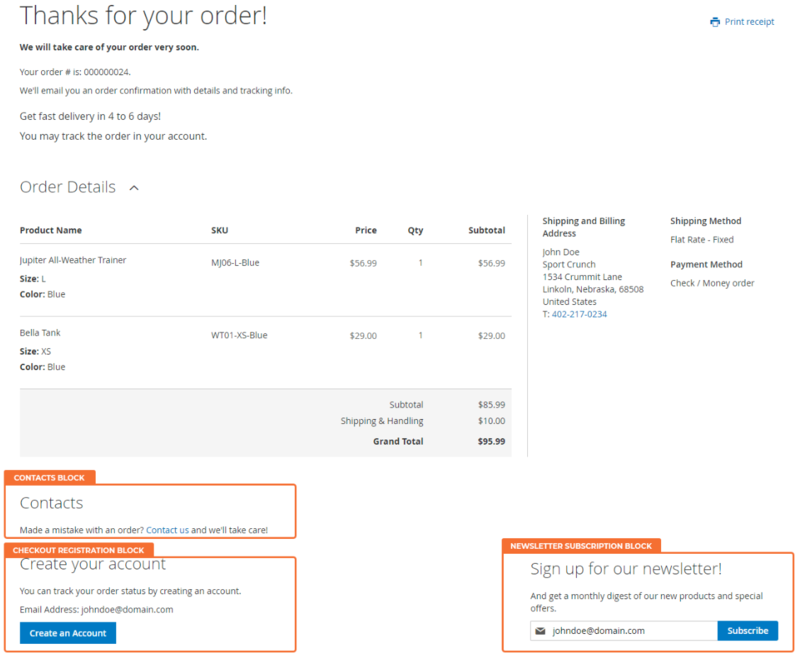 With the Magento 2 order confirmation page extension, you get the possibility to recommend related products to your customers and let them quickly add cross-sell items to the cart. Besides, you can promote particular brands by giving a link to a blog article or YouTube video. To motivate customers to follow your accounts on social media, you can place a relevant block informing them about receiving the latest news on sales and product updates on a social network. Also, you can add incentives for making future purchases on your store by offering discount coupons. 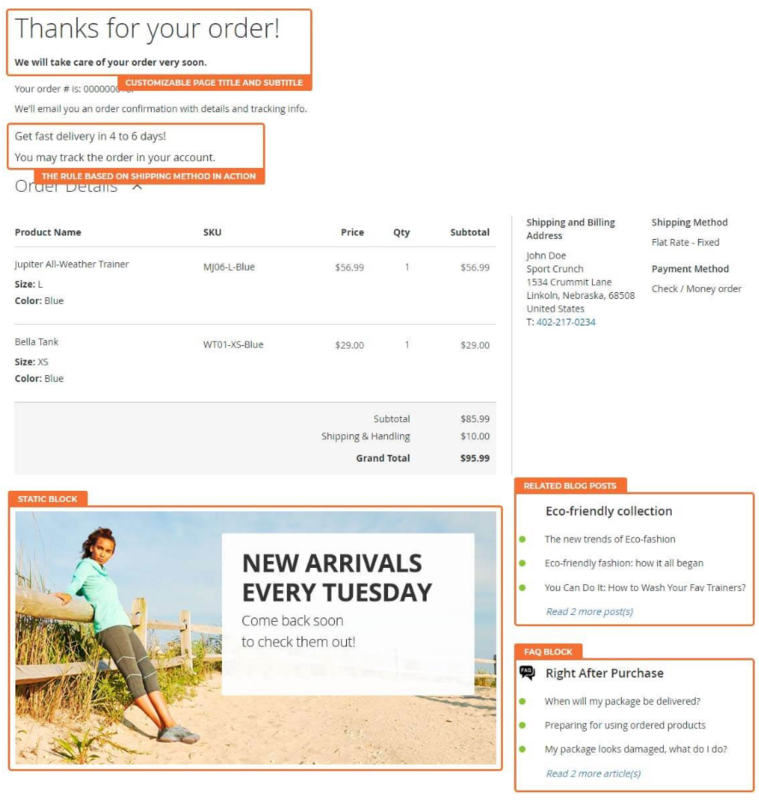 Moreover, you can leverage the Order Success Page module’s functionality to improve the post-purchase experience on your web store. This way, you let your customers quickly contact you by placing a relevant form or contacts on the thank you page. 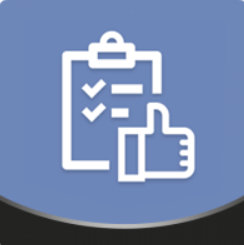 You can also provide your website visitors with the links to the specific FAQ articles to show your assistance or place a video with an explanation on some issue. The configuration of the Order Success Page extension is divided into the following sections: General, Order Summary, Contacts, Checkout Registration, Newsletter Subscription, Static Block, and Cross-Sell Block. In the general settings, you can change the title of your thank you page or leave a default one, create text for the subtitle that will be displayed below the title, and allow or disallow your website guests to print order receipts. To check how the page looks after the changes, click the “Preview Order Success Page”. In the Order Summary tab, you can enable the relevant block and choose its position: at the top or bottom of the order success page. Here, you can also set the sort order for this block, decide whether to add shipping and billing information and expand or not order items list by default. The next settings section is for the Contacts block: define its layout using one of the available position options (top, bottom, left, or right column), specify its priority in the Set Order field, and create a custom title and short description. 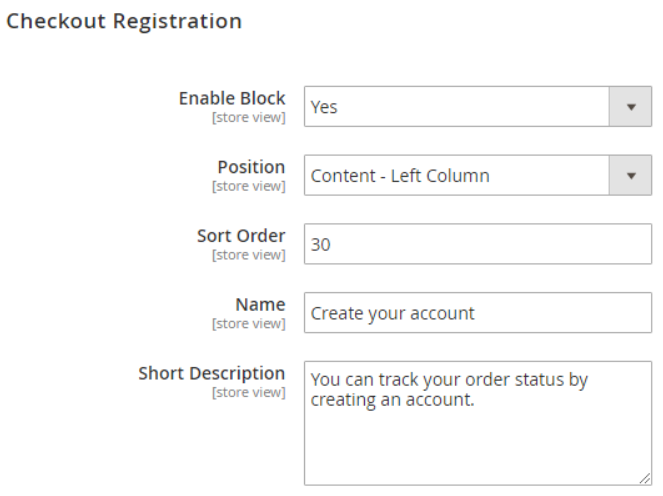 In Checkout Registration, you can enable the block for customer registration, choose its position on the page, specify the sort order, customize the title, and create a text message to encourage your website visitors for creating an account. In the Short Description area, you can add a link forwarding to a contact form. 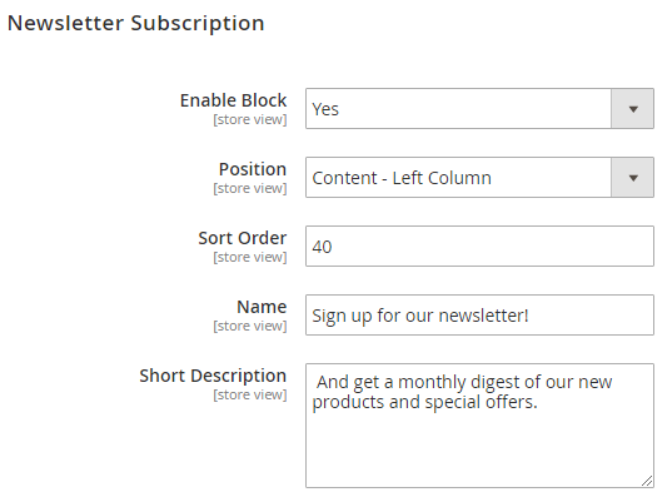 The Newsletter Subscription tab provides the same settings as the previous one. 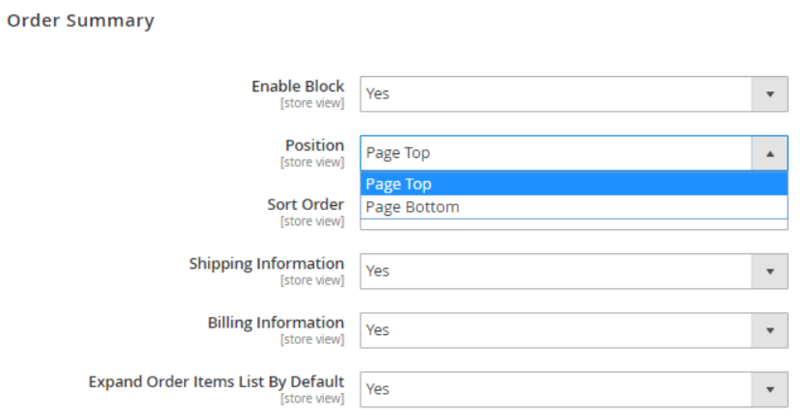 The next section lets you select a particular static block to place on the order success page. You should also choose its position and specify the sorting order. 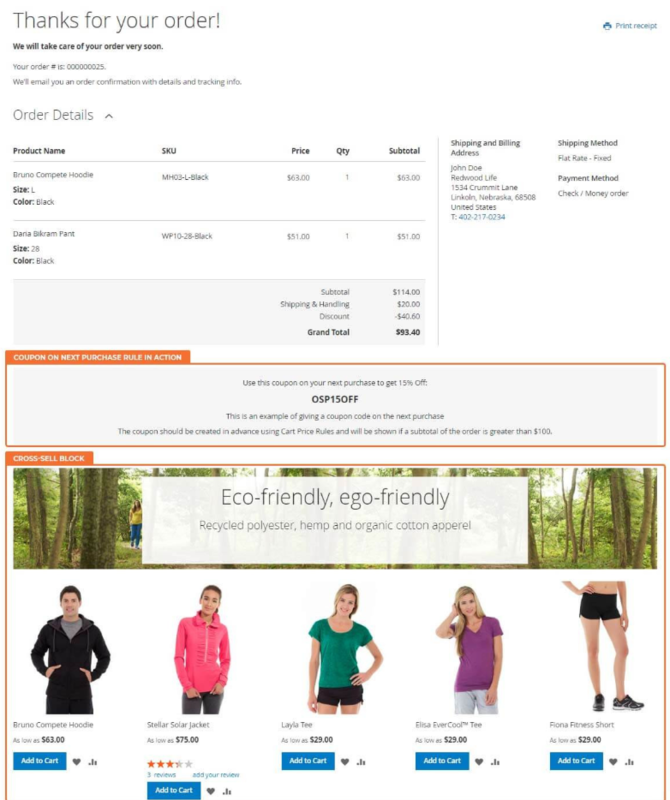 The Magento 2 custom success page module also allows placing a block for the cross-sell products display at the top or bottom of the page. 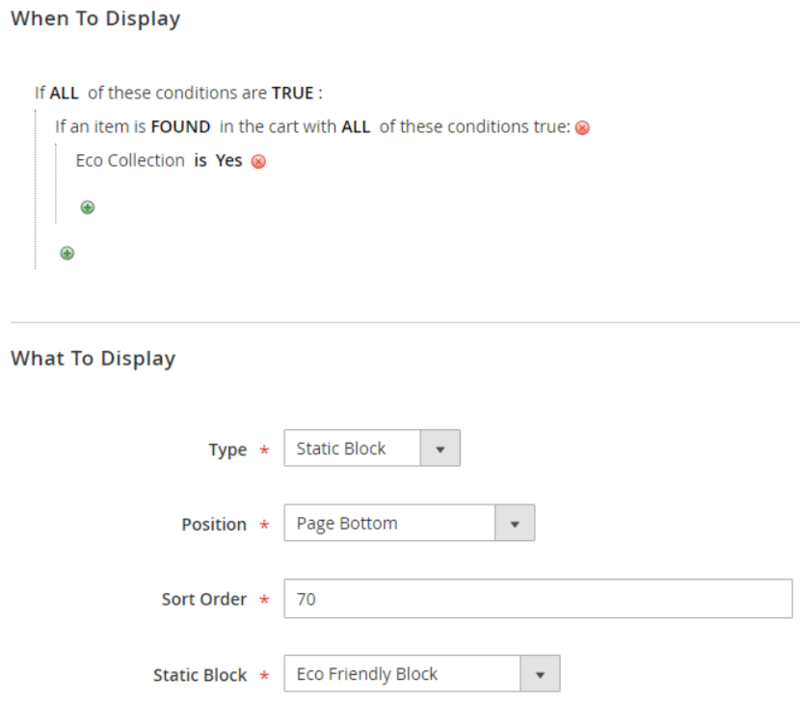 With the Order Success Page extension for Magento 2, it is possible to create rules to manage the visibility of the static blocks for different customers. When you are on the new rule page, activate your rule, create a name for it, and type its description. 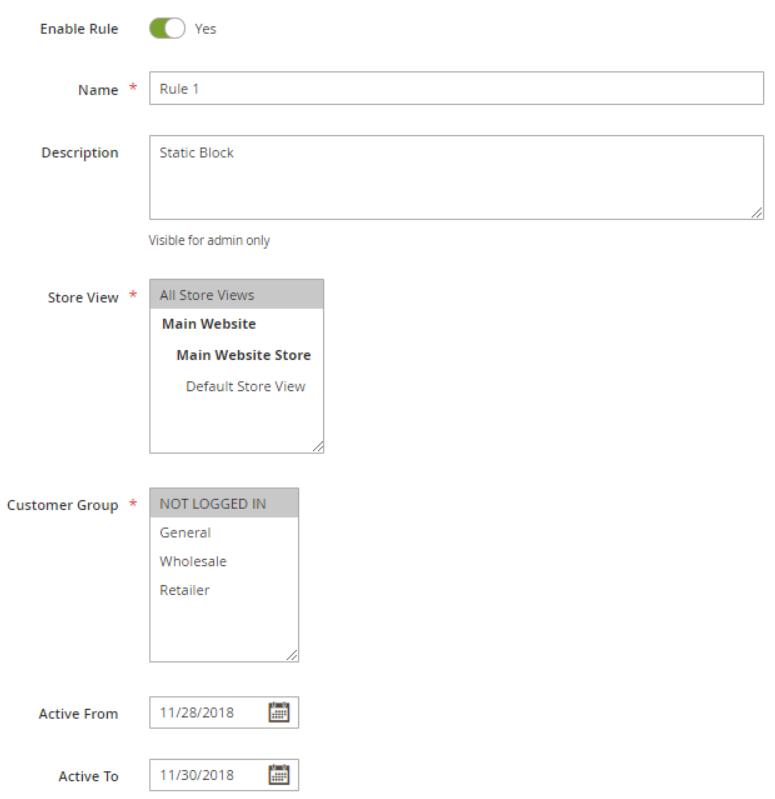 Then, select store views and customer groups for which you want to apply it and define the period when the rule should be active. In the When to Display section, you set the conditions of your rule. The options in the What To Display tab differ depending on the chosen block type: Static Block, Text/Html, FAQ Category, or Blog Category. Note that you can display FAQ articles and blog posts if you have the Amasty FAQ and Amasty Blog extensions installed on your website correspondingly. 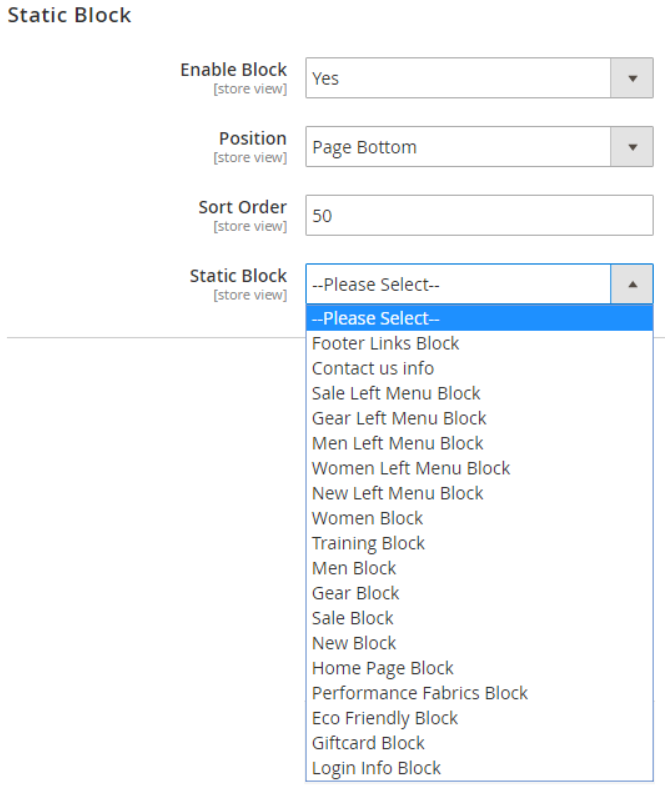 If you want to place a static block, set its position and sort order and select a specific block from previously created options. In case of the Text/Html type, choose it position, set the sort order, and create a text in the WYSIWYG editor. Using the text type, you can display a message with coupon code on the specified conditions. Let’s see a few examples of the thank you page customized using the Order Success Page extension by Aheadworks. 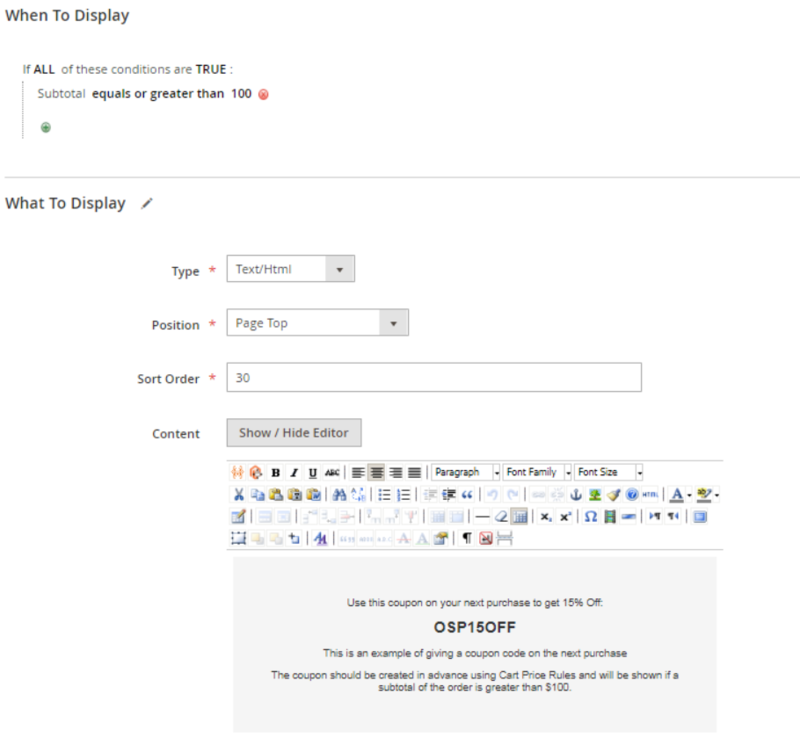 In the image below, you can view a custom title and subtitle of the page and a text message regarding the order shipment based on the rule set in the backend. At the bottom of the order success page, there is also a static block with a promotional banner and the lists with related blog posts and FAQ articles. 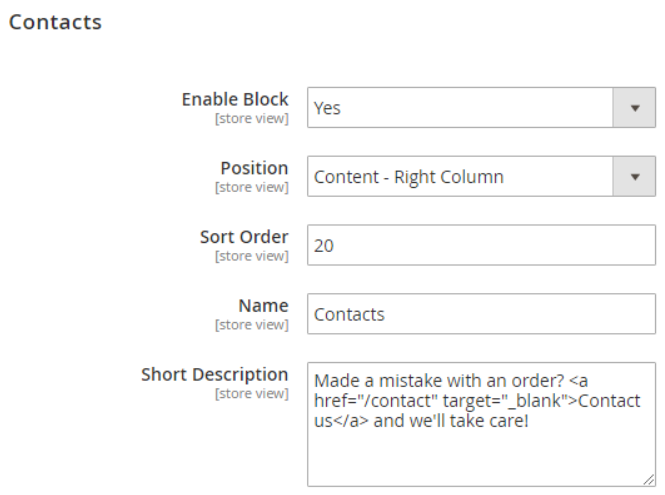 In the next example, there are contacts, checkout registration, and newsletter subscription blocks placed below the order summary. Here, you can also see a promo block with related products for cross-selling.